I’ll be joining host Graeme Simsion (@graemesimsion) and panelists Terry Buino, John Giles, and Chris Woodruff for a lively and (I’m hoping) contentious discussion about Data Modeling in an Agile Environment. This free webinar event will be hosted by Dataversity.net as part of their monthly series on data management issues. 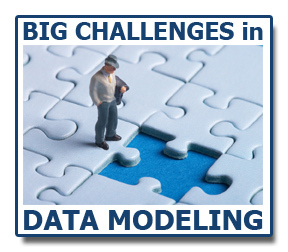 We invite you to join us in this monthly DATAVERSITY webinar series, “Big Challenges with Data Modeling” hosted by Graeme Simsion. Join Graeme and two or more expert panelists each month to discuss their experiences in breaking through these specific data modeling challenges. Hear from experts in the field on how and where they came across these challenges and what resolution they found. Join them in the end for the Q&A portion to ask your own questions on the challenge topic of the month. We four panelists come from a variety of backgrounds. Two of us are Microsoft MVPs, one just wrote a book on Agile Data Modeling and another calls himself a born-again agilist. Graeme is always the stimulating and controlling jocular host at these events…he’d have to be to manage the characters he has to herd in just a short period of time. Many data architects and modelers tell me that they can’t or won’t work on agile projects. Or that they’ve heard that there are no data models in agile approaches. Worse, they’ve attended presentations by certain industry pundits who have been so anti-architecture that they don’t understand why anyone would attempt this. But it’s not that way in practice. Most of my projects over the last few years have been agile or SCRUM. So I’m going to bring my experiences and stories to discussion, along with tips that I have for working on a software-focused delivery methodology. Find out whether agile is your friend or frenemy. All you have to do is register to attend. It’s free, too.